Check into a charming inn next to a lake, unwind in a stylish cottage in the Ozark Mountains, or spend your weekend on a beautiful vineyard with a spa. If you are looking for the perfect romantic spot to relax and rejuvenate near Kansas City, these are some of the best places to visit. 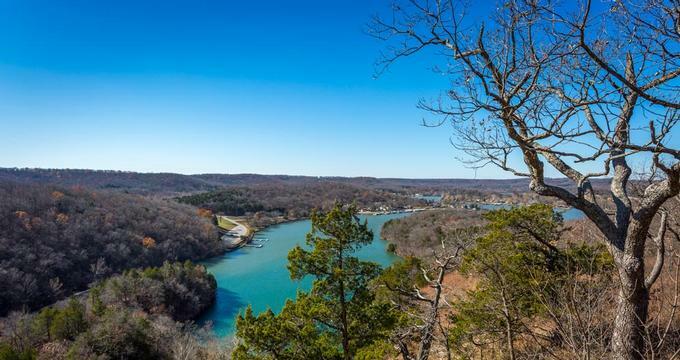 Located next to Table Rock Lake, the White River Lodge Bed & Breakfast provides guests with luxurious amenities and spectacular views of the lake. 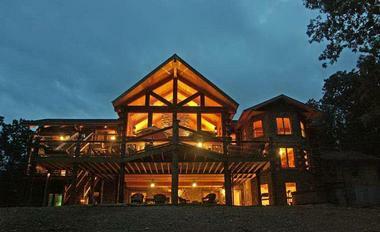 The Lodge was handcrafted with glass, Arkansas field stone, and Colorado Engelmann Spruce logs. There are four private guestrooms plus a two-bedroom suite in the 10,000-square-foot building. They all feature handcrafted log beds and some have king beds, vaulted ceilings, two person Jacuzzi tubs, two queen beds, and a living room. Each room also has both indoor and outdoor doors. All rooms also have gas-flamed fireplace, flat-screen HDTVs featuring a DVD/Blu-Ray player, DirecTV, and wireless internet along with either an in-room Jacuzzi or jetted tub/shower. The entire property covers 40 acres, providing plenty of scenic land for guests to explore. The lodge has a wood-burning stone fireplace that measures 26 feet, a sun-room area with wicker furniture and a bar, patio doors for the large deck with umbrella tables and chairs, and a Theater Room with a HDTV, fireplace, and lounge seating. There is also a fitness room, dart game, ping pong, billiards table, sauna, gas barbeque grille, guest kitchen, magazines, books, and games. There is a complimentary breakfast in the morning with fresh fruit, farm-fresh eggs, and breakfast meats. The Yates House is a reproduction of a roadside inn from 1850 which was completed in 1991. Three of the inn’s rooms are in the main building while the others are in the adjacent Garden House, which was built in 1840. Guest rooms have full bathrooms, individual air conditioning, and closets along with flat-screen TVs with DVD and CD players, robes, irons, and wireless internet. Some rooms also have electric fireplaces, fridges, jetted tubs, and/or wet bars. This bed and breakfast is great for those with electric vehicles as there is a charging station on-site. Guests can relax in the garden areas, patio, or back porch and there are places to park and store bicycles. The breakfast is prepared fresh every day and includes locally grown seasonal produce, cheese, herbs, meats, and eggs. Each room is designed to sleep two guests and features a private bathroom, cable on a flat screen, down comforter, hair dryer, robes, fridge, coffee pot, microwave, an irons with ironing board, and an alarm clock featuring an MP3 charger. Guests also get access to free parking, wireless internet, and the building’s elevator. 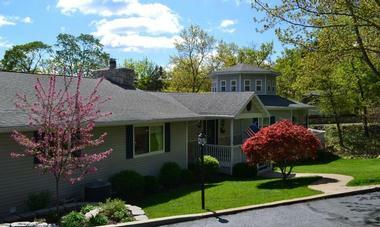 Herman Hill is an upscale bed and breakfast that has won numerous awards during its more than 20 years in the business. There are a range of room types and traditional luxury suites. Guest rooms and suites offer large private baths, Jacuzzi-style tubs for two people, steam showers, fireplaces, king-sized sleigh beds, window-side tables, private patios or balconies, fridges, TVs with cable and Blu-Ray/DVD players, fans, irons, cutting boards, glasses, wine openers, CD players, towel warmers, hair dryers, wireless internet, and other luxuries. Some rooms also have fully-stocked refrigerators. Guests may also stay in cottages or spa rooms. Guests have access to the dining deck with a gas grill and a fire pit table. The spa atmosphere of the inn is enhanced by views of the private Norton and Hermann Hill Vinyards. Hermann Hill is a vineyard and spa in addition to an inn, providing plenty of things for guests to do, including have a couple’s massage or spa treatment. S’mores are served in the evening and there is an appetizer bar and margarita machine. Guests also have cocoa, tea, and coffee in room. The daily continental breakfast is an alternative to the full country breakfast. At night, you receive ice cream, warm cookies, and Hermann Hill port chocolate-raspberry sauce. 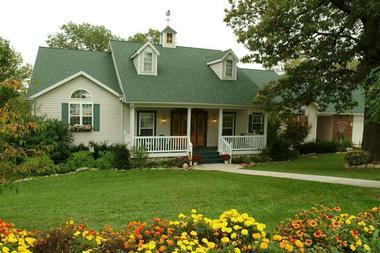 The Inn at Harbour Ridge is a bed and breakfast conveniently close to the Lake of the Ozarks. Some guest rooms include fireplaces, private patios or decks, whirlpool tubs, and private hot tubs under the stars. All rooms have wireless internet, cable TV with DVD players, air conditioning, king or queen sized beds with Comphy Company sheets, down comforters, and other amenities perfect for romance. In addition to the four guestrooms, there is also a private guest cottage with a rock patio, mini’kitchen, fire bowl on the patio, second bath with separate shower, electric fireplace, and whirlpool tub. Guests have access to the gazebo and dock along with fireplaces and TVs in common areas. There is complimentary music and movies as well as table games. Outside, you will find a swim platform right on the lake. You can take a walk through the gardens or even rent out the place for an event. Every morning, breakfast is served fireside or you can have it delivered to your room. There are also complimentary sodas and snacks. 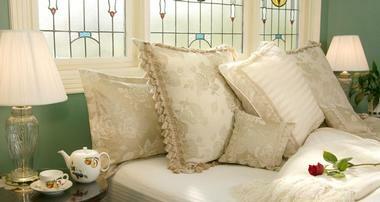 The Victorian Country Inn Bed and Breakfast is on a historical family estate built in 1896. 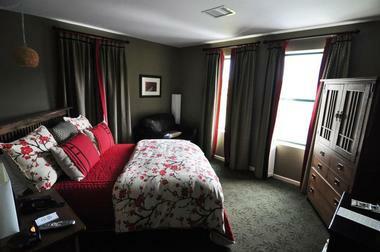 The inn has two suites and a guest room, each with a private bath, free wireless internet, and satellite TV. The Starlight Theater Suite has a queen bed and is the biggest suite with a futon, and a private movie room with a big screen. The Garden Spa Suite has a two-person spa shower with multiple jets, a king-size bed, large windows, a large flat-screen TV, and electric fireplace. The Dan Diva Derby Guest Room has a queen bed, gorgeous views, and a private shower with dual shower heads. There is also a Cozy Cabin for longer stays with its kitchenette, electric fireplace, and modern amenities. Guests can gaze out at the grassy meadows on the 20 acres of land or spend some time by the ponds feeding the fish. The extensive property has walking trails set up. 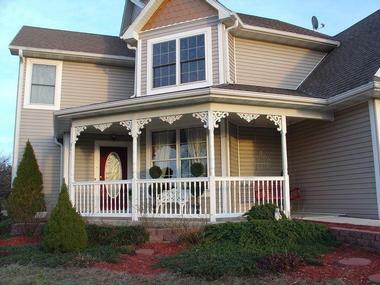 There is also a gazebo and front porch swing to relax and enjoy. The Victorian Country Inn also hosts events like Murder Mystery Theater. Guests can book a couples massage in the spa room. The Victorian Tea Parlor downstairs is perfect for reading or eating breakfast, where you will find the 24-hour tea and coffee bar. The day begins with a complimentary 3-course gourmet or country breakfast and you can have tea or coffee beforehand. The Anchor Inn on the Lake is the perfect place for a relaxing romantic getaway. Guests can choose from one of the four guest rooms within the main inn or one of the two separate cottages which are a half mile from the inn on top of a bluff that overlooks Table Rock Lake. Amenities vary slightly by room, but most inn rooms include king or queen beds, sitting areas, private exterior entrances, two-person air massage tubs, spa robes, electric fireplaces, private balconies or decks, TVs with DVD players, wireless internet, irons with ironing boards, hairdryers, and radios with CD players. They may also have a spa tub/shower combination instead of the massage tub. The cottages have even more amenities, but don’t include breakfast. They do, however, have DirectTV, private hot tubs, patio furniture on their private decks, grills, sleeper sofas, fully kitchens, and large living rooms. Guests staying in an inn room receive complimentary breakfast with fresh brewed Ozark Mountain coffee, fruit juice, and tea along with a full breakfast that is either sweet or savory. Breakfast always includes fresh fruit and the inn can accommodate dietary restrictions with notice. 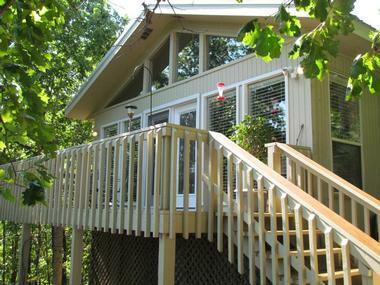 Red Bud Cove provides its guests with luxury and serenity next to the Table Rock Lake. Suites all include private baths, wireless internet, phones, DVD players, and TVs. There are queen and king suites that are perfect for couples and the honeymoon suites include fireplaces and 2-person whirlpool tubs. You can choose from one queen suite, three king suites, three honeymoon suites, or two family suites. The inn has gorgeous views and plenty of wildlife to enjoy. There are also places to swim as well as opportunities for boating, biking, hiking, and fishing. You can even rent a bike or boat nearby. There is also a hot tub available year round. The day begins with a full breakfast in the dining room. Beaver Lake Cottages gives small groups and couples the perfect chance to get away from their hectic lives in glass-front cabins in the Ozark Mountains. Every cabin and suite has gorgeous views, king beds with pillow-top mattresses, two person Jacuzzis, CD and DVD players, access to the DVD library, HDTV with direct satellite, and wireless internet. The cottages come with fully-equipped kitchens and include towels, dishes, pots, basic ingredients, coffeemakers, BBQ grills, firewood starters and firewood, and phones. There are also Jacuzzi suites with private baths, decks, and entrances. Suites have a dorm-size microwave and fridge. When guests arrive, they are treated to snacks and sparkling juice or wine. The property has various nature trails to let you explore the creek beds and rock bluffs. In the morning, suites and one-room cottages receive juice and pastries, but guests in two-bedroom cottages are welcome to use their kitchens to prepare their own meals. 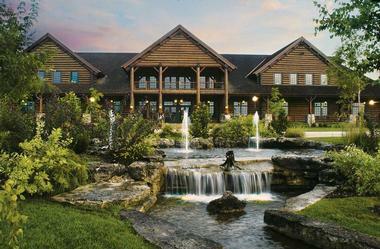 The Keeter Center lets guests stay in the Mabee Lodge with its handsome furnishings and rustic design. There are fifteen suites to stay in, each with views of the downtown skyline and the campus. All rooms have refrigerators, microwaves, coffee makers, fireplaces, private balconies, and wireless internet along with robes. Alternatively, guests can rent the Bluff House with multiple rooms including a master suite with a king bed, wood-burning fireplace, flat-screen TV and a loft suite with a roof-top balcony and queen-size bed. This house also has a living area with another fireplace, a dining area with bay windows, a lower area with a kitchenette, an outdoor custom hot tub, wireless internet, cable TV, and alarm system. Guests can explore the well-maintained grounds or take advantage of one of the indoor and outdoor sitting areas. The on-site Dobyns Dining Room in the restaurant provides delicious food made from fresh local ingredients whenever possible, including vegetables grown on-site. There is also an on-site Gourmet Bakery with fruit drinks, coffee, dessert, and fresh pastries, and the Beulah I. Winfrey gift shop. The nightly turn-down service includes fresh cookies with milk and in-room breakfast is delivered daily. 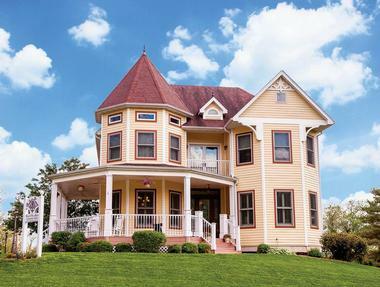 Right by the Katy Trail, the Amber House Bed and Breakfast gives guests breathtaking views combined with luxury. The rooms can include BainUltra Jetted Tubs and all rooms have individual temperature controls, electric fireplaces, ceiling fans, iPod docking stations, TVs with DVD players to view movies from the extensive DVD library, free wireless internet, private baths, luxurious linens, hair dryers, and spa-quality toiletries. Other possible amenities include 4-poster beds, soaking tubs that fit two people, walk-in showers, and a spa bath. Guests can borrow one of the inn’s bikes to ride along the Katy Trail or just go for a stroll on it. You can also schedule a professional massage at the only in-house massage studio in Rocheport. There is on-site parking, bike storage, and plenty of rocking chairs on the inn’s large wraparound porch. Wake up with a multi-course breakfast and repeat the experience for dinner. The breakfast includes fresh fruit and items like omelets, French toast, homemade yogurt and granola, pancakes, and more. 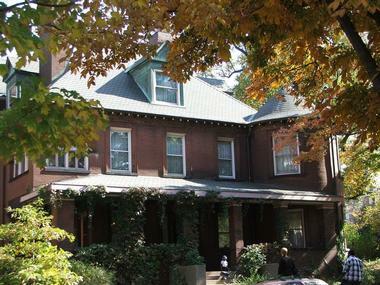 This bed and breakfast is in an 1893 custom mansion and now hosts guests in one of the four rooms. Each guest room has a private bath and other amenities include irons with ironing boards, hair dryers, free wireless internet, clock radios, and chilled bottled water. 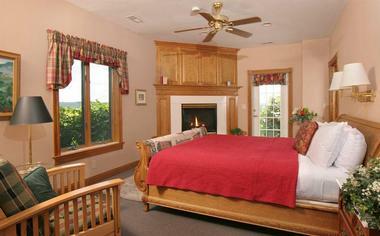 Some rooms also have wood-burning fireplaces and bathtubs in addition to the shower. The rooms are designed to sleep four but some can accommodate up to four guests. During free time, guests can relax on the porch, read in the library by the fireplace, or sit in the Victorian parlor to rest or watch TV. Breakfast is served in the dining room where there is also a fireplace. Breakfast features crystal, fine china, and fancy silverware and you can schedule an earlier or to-go breakfast if necessary. Breakfast includes fresh fruit, fresh pastries, egg entrees, breakfast meats, toast, and both jam and honey. There is also ice cold milk, tea, fruit juice, and coffee along with basics like cereal and bagels. The Southern Hotel is more than just a Sainte Genevieve bed and breakfast; it is also a historic landmark dating back 225 years. The Federal-style building has been a hotel since 1805 and was built at the end of the previous century. Staying at the inn helps transport you back in time while giving you access to all the modern amenities such as wireless internet. Every guestroom has some Victorian antiques along with other amenities. There are a total of nine bedrooms, each of which has a bathtub and most have claw-foot tubs and pedestal sinks. Some rooms also have showers, king, queen, or full beds, wicker chairs, unique headboards, and more. Guests are welcome to explore the hotel’s gardens, which include 4,000 twinkling lights at night. There is also a game room, a dining room, and two parlors along with a quilt in progress. The morning begins with special blend coffee, milk, hot cocoa, or ice or hot tea. There is also a sweet treat in the mornings and breakfast includes a main entrée, a breakfast meat, juice, fruit, and a bread item like croissants, coffee cakes, or muffins. 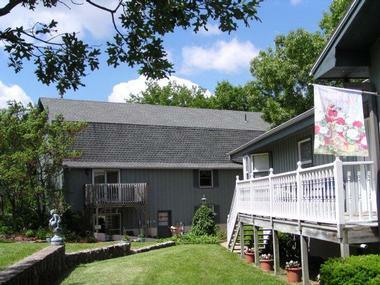 This bed and breakfast is in the Historic District of Eureka Springs and is a Christian inn with a Wedding Chapel. The building is a recreation of a historic 1880s Victorian mansion but is able to offer modern comforts since it is a recreation. The Angel at Rose Hall specializes in honeymoons, weddings, and romantic getaways and features hand-crafted furniture, stain glass windows that are a century old, and five elegant guest rooms. The suites have king-sized beds, fireplaces, balconies, and 2-person Jacuzzi soaking tubs with complimentary bath salts. Three rooms also have romantic porch swings. For added convenience, there is a turn-down service and concierge service. You can also borrow irons with ironing boards, use a fridge, or fax something. The inn has an acre of land, providing plenty of complimentary parking and areas to explore. The inn has wireless internet. The Angel is known for its delicious baked goods and grand gourmet breakfast. During the day, you can enjoy fresh fruit, free snacks, brownies, cookies, bottled water, soda, coffee, gourmet tea, hot chocolate, and cider. 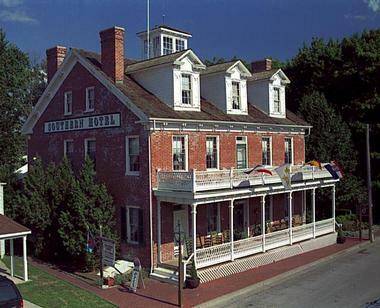 This pet-friendly hotel is just a few miles from the Tallgrass Prairie National Preserve and incredibly close to the National Scenic Byway. This small and elegant hotel has ten oversized rooms with beautiful appointments and a western flair. Each room is slightly different, but most have two queen beds while two have king beds. Some also have gorgeous views, paver-bricked patios, 12 foot high ceilings, window seats, ceiling fans, and original brick walls. No matter where in the hotel you are, you will notice that the building truly reflects its history while providing modern amenities. The room arrangements make it good for couples or families. 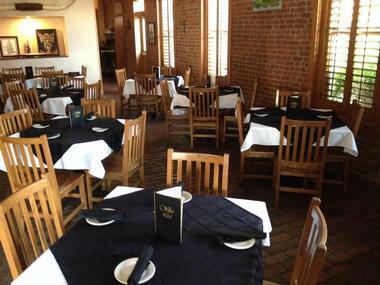 The restaurant, the Grand Central Grill, offers a relaxed atmosphere for fine dining with items like fine steaks. You can enjoy dishes like salads, sandwiches, burgers, and desserts. 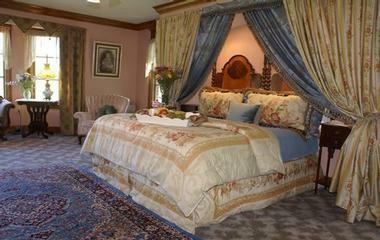 This romantic bed and breakfast provides luxury and privacy in a friendly atmosphere. Each of the five suites has a sitting area, a fireplace, robes, queen or king beds, a jetted tub for two people in the private baths, in-room phones, and cable TVs with DVD players with access to the inn’s DVD library. There is also wireless internet throughout and basic amenities such as shampoo, conditioner, hair dryers, irons, and ironing boards. You can request an iPod docking station as well. There are a range of available packages, including those for weddings, honeymoons, and other romantic getaways. Guests can add a fruit basket, chocolates, or flowers to their room as well. All guests have access to the Guest Pantry where you will find treats and homemade cookies along with tea, coffee, and soft drinks. The first night you arrive, you will find hand-dipped chocolate truffles in the room. Breakfast is served in the Morning Room and everyone eats at a private table where you can keep to yourselves or talk to other guests.